A Lake Assault fireboat, owned and operated by the Lake Vermilion Fire Brigade, provided support for wildland firefighting efforts during the Foss Lake wildfire near Ely, Minn. earlier this spring. The 33-foot craft was used to haul up to 20-person crews, and their canoes and equipment to staging areas to fight the blaze. The fire, located approximately 10 miles west of Ely, Minnesota in the Boundary Waters Canoe Area Wilderness (BWCAW), consumed a total of 936 acres and was contained and controlled on June 2nd. The landing craft style boat – with a ten-and-a-half foot beam – features twin 300 hp outboards that can reach speeds of up to 50 mph. 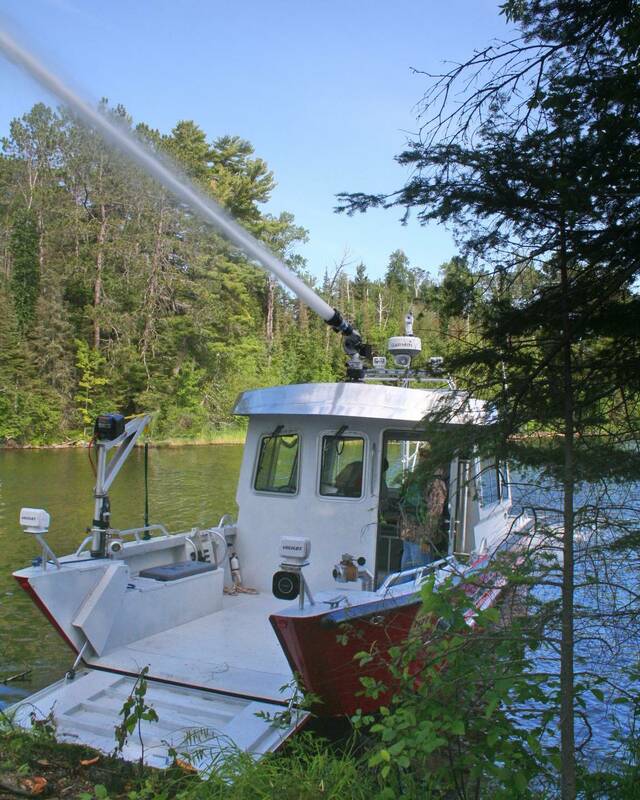 The fireboat is equipped with a 1600 gpm water pump, a 300 hp V8 pump engine, and three discharges – including a high flow monitor and water cannon.